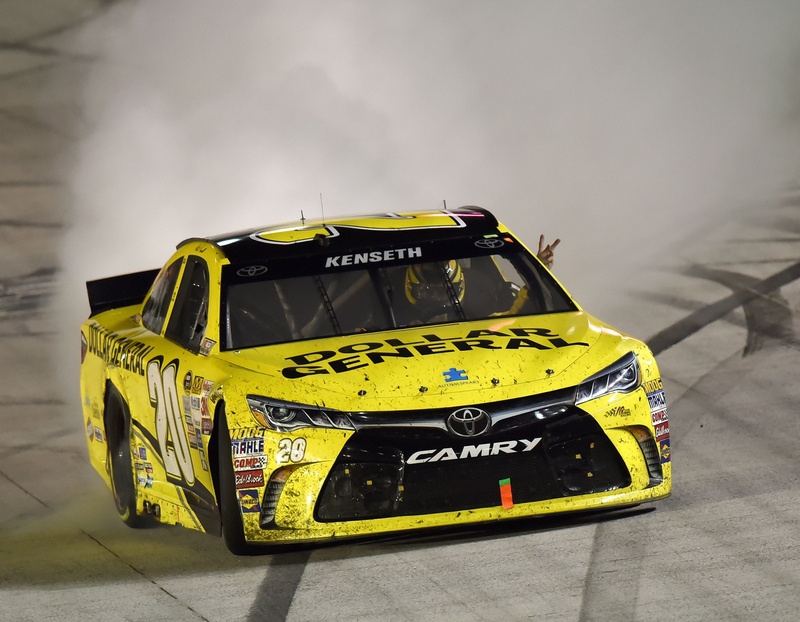 After four rain delays and 11 extra laps, Matt Kenseth finally drove to victory lane. It took him nine hours to get there Sunday at a water-logged Bristol Motor Speedway in Bristol, Tennessee. Kenseth snapped a 51-race losing streak by holding off Jeff Gordon and Jimmie Johnson on one final restart in NASCAR’s determined effort to stage a complete Food City 500 race. The start was delayed nearly 90 minutes because of rain and the race was stopped three more times, including one delay that lasted almost four hours. The final stoppage came when the race had already surpassed the scheduled 500 laps, but a quick rain shower had stalled NASCAR’s attempt to race to the checkered flag following an accident with eight laps remaining. So, NASCAR parked the cars on pit road and sent out its dryers to quickly try to give it one more shot. It was a two-lap overtime sprint to the finish and Kenseth, the pole-sitter, got a terrific jump on the restart. He wasn’t challenged in part because Gordon had a poor restart. Johnson slid past Gordon to take second place, and Gordon finished third. The race had a series of hiccups unrelated to the rain stoppages: Austin Dillon ran out of gas while running third because of the lengthy final caution, Denny Hamlin didn’t get back in his car after the first rain break because of a kink in his neck, and the two Team Penske drivers wrecked each other just 20 laps after the start. Carl Edwards and Kurt Busch were in contention until they wrecked following a restart eight laps from the scheduled finish, and Busch put together his strong run with an interim crew chief because Tony Gibson couldn’t leave his motorhome due to pain from a kidney stone. Kyle Larson, while leading, had a miscue with a pair of cars a lap down and the chaos it created sent Landon Cassill hard into the wall. Hamlin, meanwhile, said he felt something strain in his neck 12 laps into the race. The race was stopped for rain on Lap 22, and Hamlin went to his motorhome to see if he could get his neck to feel better. Instead, it stiffened and he was hardly able to turn his head when NASCAR summoned drivers back to their cars. Because Hamlin won last month at Martinsville, he’s already earned a spot in the Chase for the Sprint Cup championship and didn’t see the point of getting back into his No. 11 if he wasn’t going to be competitive. Prior to the rain delay, Brad Keselowski wrecked teammate Joey Logano and both Team Penske cars suffered significant damage. Persistent rain delayed the start more than an hour, and NASCAR rushed to get the event underway during a brief window. The weather ruined what Bristol officials had hoped would be a successful weekend for their spring race. Scott Dixon passed Helio Castroneves during a mid-race pit stop and dominated the rest of the way to win the Grand Prix of Long Beach, California, for the first time. The New Zealander started the race third, quickly passed series leader Juan Pablo Montoya and took the lead after Castroneves nearly collided with another car in the pits on lap 33. Dixon turned back one challenge from Castroneves during the remainder of the 80-lap race and passed Bobby Unser for fifth place on the career victory list with 36. Castroneves finished second, Montoya third and Simon Pagenaud fourth to give Team Penske another strong finish. Defending champion Lewis Hamilton won the Bahrain Grand Prix in Sakhir, Bahrain, to strengthen his overall lead in the Formula One standings with his third win in four races this season and 36th of his career. The British driver started from the pole for the first time in the desert race under floodlights and was largely untroubled, finishing ahead of Ferrari’s Kimi Raikkonen and his Mercedes teammate Nico Rosberg. Formula One commercial chief Bernie Ecclestone says the Azerbaijan Grand Prix will debut next season despite concerns over the country’s human rights record.